A wonderful dish for a Sunday meal. Heat oven to 350ÂºF. Cut squash lengthwise in half; discard seeds. Cut each half crosswise into thin slices; remove peels. Place squash in large saucepan. Add enough water to cover squash. Bring to boil on high heat; simmer on medium-low heat 8 to 10 minutes, or until squash is tender. Meanwhile, cook bacon in skillet until crisp, stirring occasionally. 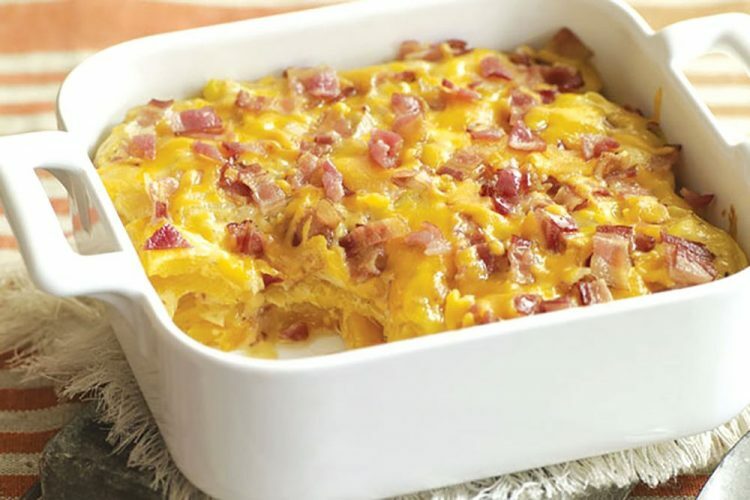 Remove bacon from skillet, reserving 1 tbsp. drippings in skillet. Drain bacon on paper towels. Add onions to reserved drippings; cook and stir 5 minutes, or until crisp-tender. Stir in flour and pepper; cook and stir 1 minute. Gradually stir in broth; cook and stir 2 to 3 minutes, or until thickened. Remove from heat. Stir in 1 cup cheese. Drain squash. Arrange half in 8- or 9-inch square baking dish; cover with half the sauce. Repeat layers; top with bacon and remaining cheese. Bake 25 to 30 minutes, or until squash mixture is heated through and cheese is melted. Tip â Can be done with pumpkin as well.